From our condo #118 on the second floor of Building 18 you look out over the heart of the plantation with a view of the ocean beyond. You will feel comfortable and right at home in our recently remodeled and nicely furnished vacation home. Furnishings include a cable 40' smart TV with DVD player, and free wifi internet access. The tropical paradise below can be enjoyed from the lanai (balcony) over a morning cup of coffee or watching the sunset in the evening. If you are familiar with the plantation you know that this location is a blend of easy access and great views. The one bedroom, one bath condo includes a king-size bed in the bedroom and newer, quality queen-size sofa sleeper in the living area (not shown in picture). The light and comfortable living, dining and kitchen area are open to each other, with a large sliding glass door and plantation shutters that take you out onto the furnished lanai. There is a full bath with shower and tub, and separate vanity area. Teak cabinetry (2010), granite tile countertops and appliances (2015). Barbeques are provided near the condo for guest use. Kiahuna Plantation: The plantation is the premier Kauai beachfront rental property in beautiful Poipu. The plantation style units are located on 35 acres of manicured lawns and gardens that bring to life the term “Garden Island” that is used to refer to Kauai. Poipu Beach is on the sunny side of the island and enjoys warm sunny days and gentle tropical breezes. Kiahuna Plantation is the only beachfront resort in Poipu. The white sand beach, backed by green lawns, palm trees and tropical gardens is a perfect to relax or enjoy swimming, snorkeling, boogie boarding or surfing. Towels and beach chairs are complimentry for guests at the beachside activity hut. You will experience why Poipu Beach has been rated the best beach in the world by USA Today. Nearby Amenities: Restaurants and shopping area are just across the road, with a fine restaurant on site at the plantation. The nearby Kiahuna Golf Course is an excellent 18 hole course with exceptional views. Island Activities: The white sand beach at the plantation is a great location for swimming, snorkeling, boogie boarding or surfing. Nearby is Poipu State Park, considered one of the safest spots for snorkeling or for children to play. Spouting Horn is a short drive away, as is the small town of Koloa with grocery store, shops and restaurants that have the feel of rural Hawaii. Enjoy a drive up Waimea Canyon the colorful “Grand Canyon of the Pacific” or drive to the end of the road and be amazed at the beauty of the Na Pali coast from above. Other options include exploring the Na Pali coast by tour boat or enjoying a bird’s eye view of the “Garden Island” by helicopter. That is an experience you won’t soon forget! We appreciate time with family and friends, relaxing and enjoying the beauty of the world around us. Our vacation condo at Kiahuna Plantation on Poipu Beach provides a quality and affordable way for you to experience what Kauai has to offer, and the joy of spending time with those you love. It is sharing this experience with our guests that motivate us. Our goal is to provide the quality of homes and service that we desire and expect for ourselves. Ceiling Fans in Living Area and Bedroom, Iron and Ironing Board, Complimentary Towels and Chairs at Beach. Stayed Feb 8-15, 2019. We loved our stay in Kiahuna Plantation unit 118! The unit itself is all updated with comfortable furniture, new appliances, granite counters, free wifi, large-screen HDTV, etc. There is no A/C (which is common in Hawaii.) It was not hot while we were there anyway, but there is always a strong breeze flowing through the unit. It has louvered windows on both sides and the breeze goes right through if they are open. Plus ceiling fans. Even in the summer I bet it would be fine. The lanai looks out on a lawn area, and there is a partial view of the ocean - very relaxing to sit and watch the birds. The owner (Linda) has a nice selection of Hawaiian music CDs which we played through the TV using the DVD player. Nice! She also has a selection of DVD Movies, including many with Hawaii themes, but we didn't watch those. Kiahuna Plantation itself is a really nice resort, with beautifully landscaped grounds. There is a nice green lawn between the buildings and right in front of the beach. You can get chairs and towels for free from a hut by the beach. Great to sit on the lawn and look at the ocean. Lots of folks sit there with a drink at sunset to watch the whales as the sun goes down. (Not easy to see them, but they are out there!) There is a sandy beach too if you prefer. The resort has a restaurant called Plantation Gardens. It is quite expensive, but the food was good and the garden setting is beautiful. We actually ate most of our meals at "Lava's", the outdoor, beachfront bar/restaurant near the pool at the Sheraton Kauai resort, which is right next door. Happy hour 3:00 to 5:00, then have dinner while watching the waves as the sun goes down. Paradise! The food was REALLY good there and the prices were reasonable (for Kauai). Kiahuna Plantation doesn't have its own pool - it provides its guests membership to the Poipu Beach Athletic Club, which is right across the street from the resort. Nice pool, workout area, and a restaurant over there. The Poipu area is a nice home base to explore the South and West shores of Kauai. Great beaches in the area. Close to the National Botanical Gardens, Spouting Horn, etc. Not to be missed are Waimea Canyon and Polihale Beach on the west side of Kauai - each are about an hour drive from the resort. There are plenty of stores and restaurants nearby Kiahuna Plantation too. All in all, a highly recommended vacation rental for exploring the south and west of Kauai! We loved Kiahuna 118. The unit is clean and well equipped with a stocked kitchen and lots of beach supplies. The view across the property and out to the ocean is lovely. We appreciated the quick walk to the beach, which was perfect for snorkling, boogie boarding, or whatever. We went to the athletic club every day. The pool really is just for kids, in our opinion, but the tennis courts and gyms were great. Be sure you walk across the street to Keoki's for dinner. We ate in the bar and grill which was fun and not too expensive. Also, be sure to check out the very nearby Heritage trail (from Shipwreck Beach, about a mile away). 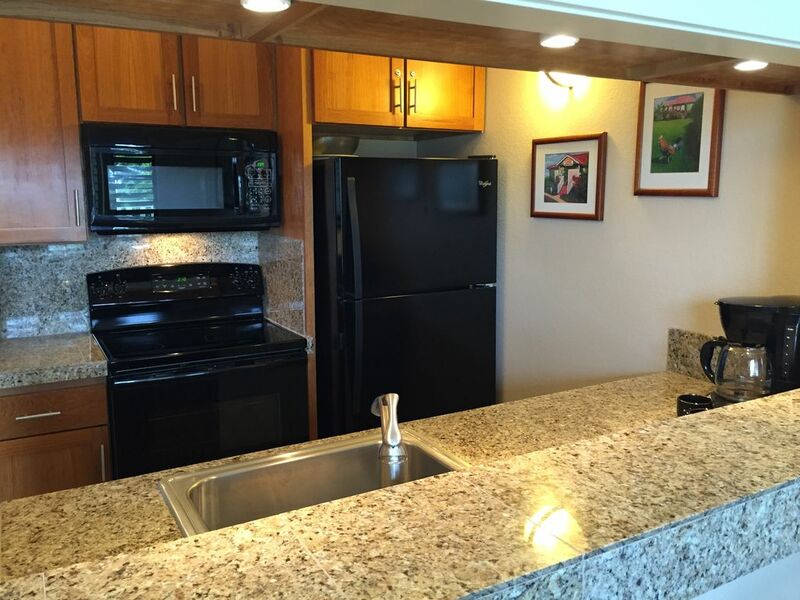 You'll love Poipu and this condo! Perfect condo for our stay with everything we needed. Quiet even though it backed the road. We loved being so close to the beach and enjoyed the beautiful grounds. The condo was very clean and was well equipped with both kitchen and beach items. It was handy having the beach hut where you could get chairs and towels. We would have liked insuite laundry but there was laundry available on site. We also used the Althletic Club across the road which was handy. Love the area. Lots of restaurants and shopping nearby. For our first time we chose the south. It was perfect to explore the whole island and we did!!! We drove all all and saw as much as we could. We look forward to coming back and enjoying Kauai again! The kitchen was inadequately stocked with appliances. The patio was covered in cobwebs. Only one bed (a pullout couch however). Water Sports, Golf, Shopping, Hiking, and Enjoying the Natural Beauty. Tour activities include Helicopter Rides, Zip-Lining, Four Wheeling, Tubing, Kayaking, Snorkeling, Boat Tours, Sunset Cruises.